Pinterest is pretty much as big as Twitter, and it has a completely different audience. Around 68% of Pinterest users are women, and half of them are mothers. 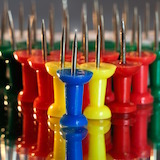 Pinterest is a great place for marketers, because it’s so underestimated. People are much more likely to buy a product that they spot on Pinterest than on Facebook. Many companies experienced a huge increase in revenue thanks to being on Pinterest early on. It’s definitely a good platform to experiment with. Pin images that are very visually attractive. On Pinterest, you can have collections (boards) of images, whether they are your own or pinned from another person. Other people visiting your page may repin your images or follow you to see what more you will share. Just like on Twitter, you can mix pins and add your own perspective. This means that you can repin someone’s picture and add your own comment, adding some useful and interesting information. Giving value. Consider having boards that are not directly connected to your brand. This will attract a completely new audience that might not be directly interested in your product, but once they visit your page, they might be attracted. Comments are not very popular; that’s why they are very powerful. Remember to be genuinely interested in the other person and the subject. Make a connection, don’t spam. As with every service, Pinterest has rules, and these rules do not differ much from the rules in the real world. Show respect, be truthful, and be generous with your knowledge.